Ten albums into an already acclaimed career, STEPHEN SIMMONS sharpens his rootsy folk-rock with A World Without, a record that mixes the twang of country music – a genre that provided the soundtrack for his childhood in small-town Tennessee – with the sharp observations of a singer/songwriter and the stomp of rural, roadhouse rock & roll. A World Without also features harmony vocals from his father, uncle, and sister, a move that allows Simmons to pay tribute to the family members who’ve inspired his career. It’s an album that hits close to home in more ways than one. Contributions from his longtime band members – including keyboardist Molly Jewell, guitarist Dave Coleman, pedal steel guitarist Alex McCullough, drummer Tim Blankenship, bassist Duane Blevins and producer/utility player Eric Fritsch – provide the backdrop for Simmons‘ voice, an alt-country croon inspired by everyone from Don Williams to Bruce Springsteen. 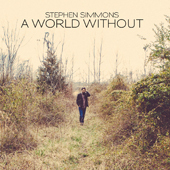 Kommentare deaktiviert für The Big Show was yesterday, today is A World Without – new album by STEPHEN SIMMONS!